Here it is the end of Canada Day, our national Birthday/Holiday. The sun shone. It did not rain; a bit of a novelty for us recently. I pulled several baskets full of weeds and celebrated by getting the gravel paths that make up the wonderful wander, clear of weeds. I’m about to leave the garden for almost two weeks and I’m still trying to get caught up with all of the jobs that were left from my 10 days away in mid-May. It’s amazing - the weeds that were an inch high in early May and would have been easily removed then with a quick swipe of the hoe, now require a major excavation and back fill. I, of course, refuse to admit to having any weeds and continue to try and admire the growing native plant collection that is crowding out my Onions. We ate the last of the early peas tonight and before we leave I will rip out those vines and their wire supports and sow some new lettuce and beets and carrots to take over their space while we are away. I should have started some new Kohl Rabi plants to put in those spaces but time is a finite resource. The Spinach is also done and that will free up some space that the rapidly growing potatoes will quickly occupy. Those potatoes have been weeded and hilled, a very important step to maximize their yield. There are an amazing number of Potatoes growing in odd spots in the garden this year. I obviously did a poor job of harvesting last year’s crop and the ones I left behind seemed to have overwintered quite successfully. I’m trying to leave these “weeds” to grow among the Onions and it will be interesting to see what they yield this year. My large Ash tree in the middle of the back yard is always slow to leaf out and this year was no exception and now it is being defoliated by a strange bright green nymph (that's him/her in the top picture,) that moves quite rapidly around the branches. 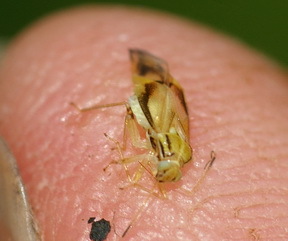 It produces an adult bug with an interesting colour pattern on its wing covers. I have no positive identification for it yet. I just hope the tree survives this huge leaf loss; as I’m not about to undertake a spray program on a 15 - 20 m (50 - 60 ft) tree. Gardening, as always, has a new and interesting question waiting for its practioners. The great mulch experiment continues and if nothing else I will go bankrupt buying bags and blocks of different mulches. Some certainly look better than others, at least to my artistic sensibilities, but it is too early to tell if they are performing any differently. Moisture retention not being a problem in my part of the world so far this year. 24 hours without rain is a noteworthy event. Despite the moisture there does seem to be a minimum of weeds pushing through any of the mulches. 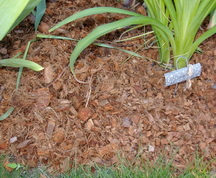 The coconut husk mulch that comes in a compressed block was available from two different suppliers and the price was a dollar different. There was an interesting difference in the product. The cheaper one, the left side of the picture was much more coarse and fibrous than the right pictured more expensive one. Stay tuned for updates on this experiment. Get ready to go on a garden adventure with me. Even before our son’s wedding, the reason for the trip to England, we will spend a day at the Hampton Court flower show and then after the festivities we are planning gambol through a gaggle of gardens. A return visit to Wisley the home garden of the Royal Horticultural Society, to see it mid summer. Our last trip was in early spring and the differences should be interesting. Sissinghurst and Great Dixter, they are both relatively near Folkestone where the wedding is, are also on our list and then we will go towards London and spend our last day at Kew Gardens. All of this will show up at some point on Gardening-enjoyed and I will report bits of it in a couple of the next issues of Dallying In The Dirt. Highspeed internet connections in hotel rooms are wonderful things and I will try to find time to tell you all about these gardens between visits to them and to the pubs, the other wonderful feature of a British holiday. Barb asks? How did the Nematode thing work out on your Iris borer problem? Ken Answers! It was mostly very successful and I will put up a whole page about it soon. The really interesting discovery was the differing response between varieties. Most of the Iris show no borer damage. In the garden behind the garage, there are four large clumps of different Iris. In one section it is almost impossible to tell where each of three varieties stops and the others start. One of them did not bloom at all this year and that same variety had a significant borer infestation while the two immediately adjacent, appear to have no borer problem at all. They would all have been similarly soaked with the nematodes as one large clump. Interesting. 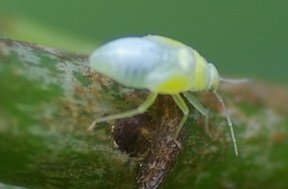 If this continues to prove a varietal susceptibility then you know which varieties will no longer have a place in my garden.